3 miles and weights on the schedule today. I'm not sure I like doing both before work but its done now. It was freezing out on my run this morning in the teens for temperature. Good thing there was no wind or it really would have felt cold. The one good thing about doing weights after my run is it helps me warm back up again. So I'm thinking this is the year of new things. Yesterday I talked about Yoga and those of you that gave me some pointers - thank you! I think I've decide to try the yoga app in the iPad first which is a free 20,40 and 60 minute routine to at least get used to some easy poses and I'll start this up this weekend on my rest day on Sunday. In the past, I've also considered doing a duathlon or a triathlon....but I'm a runner. My biggest stumbling block is the swim on the triathlon. First, I'm not good at it. Second, I don't have access to a pool unless I pay for a gym membership and its not that important to me at this point. My thought is to just go for it and sign up for a summer sprint. I'm sure I could muddle through the swim......maybe. Another option is start off with a duathlon. I've got a road bike and a mountain bike so I could sign up for either and it would give me an opportunity to try it. The races sure seem more money than the running events. I'm used to paying around $50 for a half marathon so I guess the cost isn't much more than a running event. I guess if you take out the $12 USAT fee, most are fairly reasonable. I'd only be looking at doing a sprint distance. You might recall that I spectated at a triathlon last year. It was really exciting to see all the athletes go through the transition area. This event was up in Gaylord in July which can be hot or cold. So give a newbie some pointers? Anyone do a duathlon before? Would you recommend I just go for it on the triathlon? What's the first race you did? Anyone local recommend any great races during summer where I won't need a wetsuit? Maybe I "just" go with the duathlon. I think it depends on if you will be satisfied from "just" doing a duathlon, or will you finish and still wonder what it would be like or wish you had done the tri. 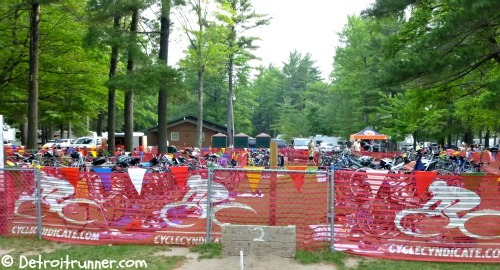 If you are at all attracted to the tri I am sure you could make it through I sprint tri swim. I barley swam at all before my first sprint tri and made it through the swim and had a great time. My biggest suggestion is to invest in a pair of tri shorts and go for it, I think you'll love it. i've done two olympic distance triathlons without really training (and recovering from injury on the 1st) and i'd say that anyone in decent run and bike shape could do a sprint as long as they know how to swim. my suggestion is to figure out what events interest you the most from either a training or racing perspective. if you take the easier way out you might get bored and not accomplish as much as you're capable of doing. one caveat though: i'm primarily a runner, but i also played 8 years of water polo, worked as a lifeguard, and started surfing at 12 so the idea of swimming through a crowd of people doesn't faze me.